What do the states of Montana, Vermont, New Mexico, Alaska, and Mississippi have in common? 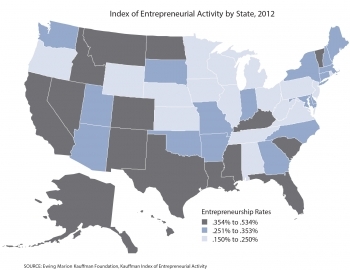 They are, according to a report published this spring by the Kauffman Foundation, Index of Entrepreneurial Activity, 1996–2012, the states that posted the highest rates of entrepreneurial activity in 2012. • Montanans operate 530 businesses per 100,000 adults, Vermonters and New Mexicans operate 520 businesses per 100,000 adults, and Alaskans and Mississippians operate 430 businesses per 100,000 adults. • A most important measure—the formation of businesses with employees—held steady from 2011 to 2012: At 0.11 percent (meaning 11 employer businesses per 100,000 individuals), an average of 193,000 new employer businesses were formed each quarter in 2012. 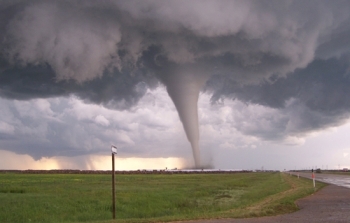 Only a few weeks ago, an EF5 tornado ripped through Oklahoma. The 2013 Atlantic hurricane season just began, and forecasts predict that it will be a very active season. Whenever events like these may occur, the Department of Commerce is ready to help communities across the country prepare for and recover from natural disasters. The U.S. Economic Development Administration (EDA) is one of the Commerce bureaus that assist in disaster-recovery efforts. Just last month, EDA announced grants totaling $54.1 million for disaster relief to 15 communities in 12 states and territories. For example, EDA announced a $20 million investment that will help redevelop the 20th Street corridor in Joplin, Missouri, where a devastating tornado in May 2011 claimed 161 lives, flattened large sections of the city, and destroyed more than 7,000 housing units. In this issue of Innovate@EDA, we are pleased to be joined by the leading authority on business clusters, Dr. Michael Porter of Harvard Business School, who answers some probing questions about the vital role that clusters play in our nation’s economic life. Dr. Porter also talks about an impressive new online tool, the U.S. Cluster Mapping website, developed through a partnership between EDA and Dr. Porter’s Institute for Strategy and Competitiveness. Regional economies have of course long been a focus of our efforts at EDA, and we highlight several of them in this issue, including the food processing and dairy cluster located in upstate New York and bioscience cluster in St. Louis anchored by BioSTL. Michael E. Porter is the Bishop William Lawrence University Professor at Harvard Business School. He is a leading authority on competitive strategy, the competitiveness and economic development of nations and regions, and strategic approaches to social problems such as health care and corporate responsibility. In 2001, Harvard Business School and Harvard University jointly created the Institute for Strategy and Competitiveness, dedicated to furthering Professor Porter’s work. Dr. Porter recently answered some questions about the importance of clusters to U.S. economic competitiveness and the benefits that recent federal initiatives in promoting clusters will bring to the U.S. economy. a directory that allows users to profile cluster organizations and initiatives throughout the country. The Obama Administration is accepting applications for the first phase of the new Investing in Manufacturing Communities Partnership (IMCP). The IMCP is an initiative that will help accelerate the resurgence of manufacturing and create jobs across the country. It is designed to reward communities that demonstrate best practices in attracting and expanding manufacturing by leveraging and integrating targeted investments in workforce training, critical infrastructure, research, and other key assets. For nearly a decade, officials in western New York’s Genesee County have been nurturing a food processing cluster, with a special focus on dairy products, at the Genesee Valley Agri-Business Park (GVAP) in Batavia, New York. The announcement last year of an EDA investment of $1 million for infrastructure upgrades is a perfect example of how a locally-led, cluster-focused development project can be catalyzed by EDA financial assistance at a crucial point in its expansion. The business park is a one-of-a-kind, 200-acre site that is focused on the agribusiness and food processing industries. It is run by a public-private partnership, the Genesee Gateway Local Development Corporation (GGLDC). Amenities include access to a ready water supply via the local aquifer, a pretreatment facility, and excellent transportation links—qualities that have already attracted major international food processors, such as Alpina, as well as smaller producers. The 2013 Economic Report of the President noted that “active government policies helped the economy avoid an even deeper recession and have played an important role in supporting the recovery.” One of these policies has been the Obama administration’s strong support of regional innovation clusters (RICs) by means of coordinated multi-agency investments. EDA has been a key player in these efforts, both alone and in concert with other federal agencies. In FY 2009, for example, EDA invested $50 million from its Recovery Act supplemental funds to promote the development of RICs. Deputy Assistant Secretary Matt Erskine traveled to Joplin, Missouri, on May 22 to announce a $20 million EDA grant to the city to help redevelop the 20th Street corridor. Two years ago Joplin was devastated by a tornado that caused 161 deaths, more than 900 injuries, the loss of more than 7,000 houses and apartments, and severe disruption to the city’s economy. The city’s 20th Street corridor project includes a new public library, community resource center, and tornado shelter. It is an integral part of Joplin’s long-term master plan for recovery, incorporating mixed-use space for retail, residential, dining, and entertainment uses. It will also support green development in the city. The grant follows previous EDA assistance to the Joplin area in the aftermath of the 2011 tornado, including $341,000 to support the hiring of regional and local disaster recovery coordinators, and $3 million to support the rebuilding of the Joplin School District’s Franklin Technology Center, a career training center. The new EDA grant is part of a $200 million appropriation made by Congress to help communities that received a major disaster designation in fiscal year 2011 with long-term economic recovery and infrastructure support. For more information on EDA’s role in disaster recovery, visit the EDA website.